And then, the clock strikes six, the alarm buzzes, and you fumble around looking for the snooze button. Maybe you even put the alarm across the room to encourage you to get up and stay up. But, for whatever reason, you can’t seem to bounce out of bed. It could be that your body clock is out of sync, making sticking to a regular schedule more challenging than it needs to be. 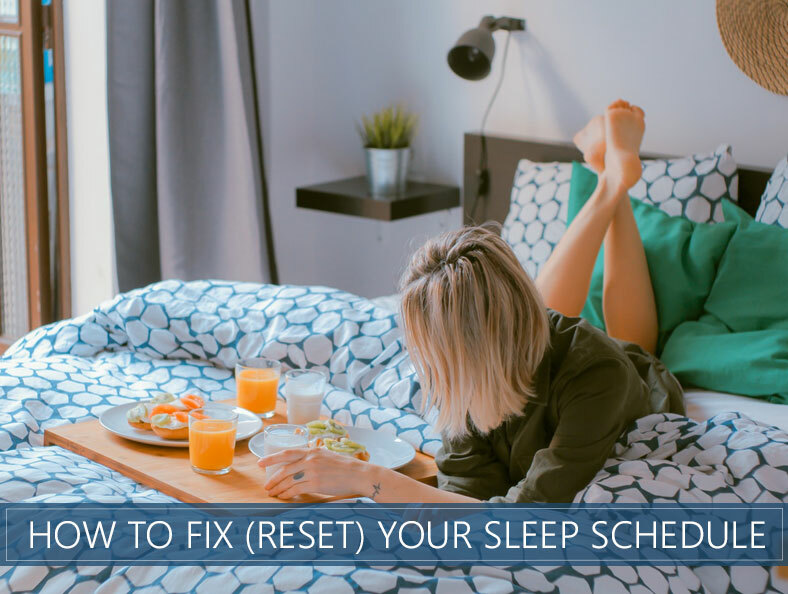 Whether you’re staying up too late, struggling to get out of bed in the morning, or you’re burning the candle at both ends, this article will give you plenty of helpful tips to fix your sleep schedule. But first, let’s answer the question of how you got off track in the first place and why there’s no magical reset button. Many of our biological functions, including sleep, are controlled by our internal body clock, also known as a circadian rhythm. It’s a 24-hour cycle that gives the body cues about when it’s time to eat, sleep, digest food, etc. Just about every organism has one, though some species don’t have the same 24-hour schedule that humans do. So, if you’re binge-watching a show on Netflix, your body will at some point try to tell you that it’s time for bed, even if you have the lights on. However, override these messages long enough, and you’ll be on a whole new sleep schedule. While resetting your schedule isn’t going to occur overnight, it might not take as long as you think. 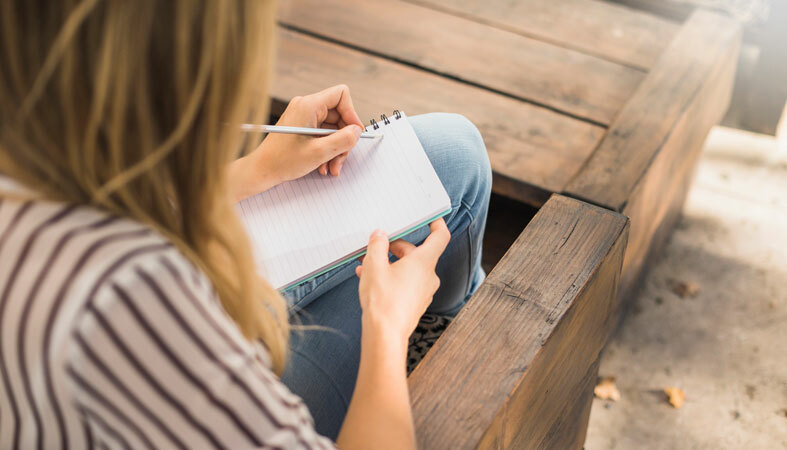 Here are 11 tips to help you get back on track. The most effective, and perhaps most difficult, thing to do is to have a set time that you go to bed each night. Then plan to wake up at the same time each day as well. So, if you decide that 10 p.m. is your desired bedtime, you should try to go to bed at that time every night. Having a nighttime routine can help signal your body that it’s time for bed when you’re not feeling drowsy yet. It could be as simple as brushing your teeth and washing your face, or you may prefer to develop a more elaborate routine to train your body that the day is ending. According to Heidi Connolly, MD, chief of pediatric sleep medicine at the University of Rochester Medical Center, you should do an activity or series of tasks that cure your brain that it’s time for sleep. If you wake up in a dark bedroom, then your internal clock may not register that it is daylight. So, first thing in the morning, make sure your room is well-lit. Look out the window or go outside so you can experience some sunshine. If it’s winter or cloudy, bright lights in the home can help brighten your morning. Morning sunlight is important to start your day on the right track, and here you can see more details and benefits. Modern society makes this step to resetting your clock tricky. Most of us are used to screen time after dinner, whether it’s watching television, working on a computer or browsing emails and social media on a smartphone. The trick is to eliminate these lights when it draws closer to bedtime and keep these devices out of the bedroom. Here you can read more about the light exposure (of your TV or any other electronic device) that affects your bedtime. Exercise naturally makes you tired as it expels energy. There is one caveat, though. Avoid activity too close to bedtime, or it will make you extra alert, causing the onset of sleep to be a challenge (we explained this topic here, if you want to see specific details). If you feel the insatiable urge to do something physical right before bed so you relax, try a stretching session or a light yoga practice to prepare for sleep. Avoid large meals right before bedtime. Not only do they keep you up, but they can also cause acid reflux and heartburn, which could wake you up in the middle of the night. If you’re feeling hungry, try a light snack that’s high in protein and low in sugar. A handful of raw nuts is satisfying without being overly filling. Resisting naps is hard, and some would say it’s unconstitutional to ban them. However, a long nap could signal the internal clock that you’ve slept for the night, and that makes falling asleep at bedtime a struggle. Therefore, we suggest limiting naps to 20 to 30 minutes. That’s long enough to help you feel refreshed, but not so long that they plunge you into a deep sleep. Some experts will say to avoid caffeine altogether, but that seems excessive. Instead, we say feel free to enjoy your regular cup of coffee in the morning or a soda at lunch, but taper off as the day continues, and stop your intake entirely within six hours of bedtime. Prescription sleeping pills are helpful for short-term, temporary help for things like jet lag or a particularly stressful circumstance. However, when you’re trying to get your internal clock on schedule, they could do more harm than good. If you find that it’s a challenge to fall asleep during this reset period, reach for something natural like melatonin. As a supplement, it’s incredibly useful in helping people fall asleep. Plus, it’s made naturally by the body, so you’re not introducing foreign chemicals by taking it. For upcoming trips to faraway lands, you can set your biological clock in advance of your departure date. That way, when you arrive at your destination, you’re already acclimated and ready to have fun (or work). To do this successfully, start shifting your bedtime a few days before your trip. For example, if you’re going somewhere that’s three hours ahead of your local time, go to bed an hour earlier each night for three consecutive nights. When you arrive at your destination, you’ll be on local time! Hopefully, your employer doesn’t make you work different shift schedules. A graveyard shift on one night and then an early shift a few days later is going to confuse your circadian rhythm. Do your best to make sure that your work or school schedule is relatively consistent. If you have no control over the schedule and you sometimes work an overnight shift, one thing to try is wearing sunglasses on your way home. That will block out some of the brightness and make the transition to a dark bedroom seem more natural. 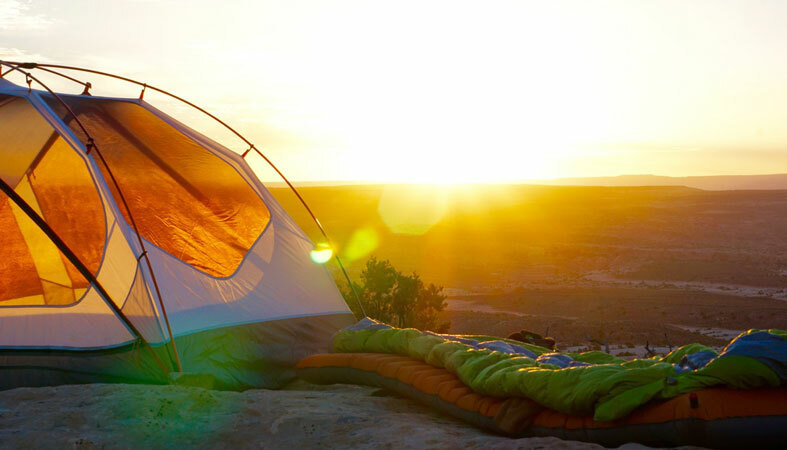 Grab your tent, leave your laptop behind, and head to the great outdoors. By going camping, you eschew most of the distractions (and bright lights) of modern society so you can reset your biological clock with relative ease. By going to bed when it’s dark, and you feel sleepy, and then waking up with the sun when you feel awake, you’ll be able to reset your cycle in no time! Consistency is critical for success in almost any endeavor. You can quote us on that. And sleep is no exception. Make a concerted effort to go to bed and wake up at the same time each day. We know what you’re thinking: you love a good lie-in on the weekends. How about a compromise? Sleep in an hour later on the weekends if you must, do your best to maintain a constant schedule. We’re not saying to avoid them altogether! When done correctly, a nap can be a much-needed energy boost to get you through the day. Opt for a nap between 1 p.m. and 3 p.m. and limit it to no more than 20 to 30 minutes. If you’re a caffeine addict, you’re going to have to make a couple of sacrifices. You can still enjoy your coffee, soda or energy drinks early in the day, but abstain within six hours of bedtime. So, if you plan to hit the hay at 10 p.m., you should have finished your last drop by 4 p.m. at the latest. If you’re making an effort to go to bed earlier to get your cycle back on its natural rhythm, you may find it nearly impossible to fall asleep on schedule. That’s why we recommend having a relaxing nighttime routine to prepare for sleep. Take a warm bath with soothing essential oils, enjoy a cup of hot, herbal tea or do some light stretching. Reward yourself with a book (just avoid e-readers), and it’ll be lights out in no time. The cursed blue light given off by electronic screens has been the subject of countless research papers. There’s something about the blue light that dramatically interferes with the circadian rhythm. So, if you’re trying to get your cycle to run normally again, we suggest avoiding screens like television, computers, smartphones, and e-readers within an hour before bed. The electronic devices aren’t the only things that need to be banished from the bedroom. You should also get rid of any light sources, so get darker curtains, and if you have an alarm clock with a bright digital display, turn it away from the bed, so it’s not shining on you while you sleep. Keep the bedroom at an ideal sleeping temperature, which experts agree is between 60 and 68 degrees. We know it’s hard but do your best to avoid stress as you go to sleep. Tomorrow is a new day, and all the problems and issues will still be there. There’s not much you can do about them at 2 a.m. from your bedroom while wearing pajamas (or your birthday suit). If you genuinely can’t let go, write down what’s bothering you or make a to-do list to reference in the morning. Sometimes, just getting the frustrations or task lists out of your mind and onto paper can make a world of difference. Does pulling an all-nighter reset your sleep cycle? Fortunately, one all-nighter may be the only thing you need to get you back to your regular 11 p.m. bedtime. Wake up at your usual time. It could be 7 a.m. or noon. It doesn’t matter in this case. Stay up until the next night and go to bed at your target bed-time. As an example, let’s say it’s Friday morning and we woke up at 10 a.m. We’ll stay up all day and night, and then we’ll finally go to bed on Saturday night at our goal time of 11 p.m. In all, we will have been awake for 37 hours. Needless to say, this exercise is going to be a challenge because you’ll be staying awake for well over 24 hours. Avoid driving or any other activity that could be dangerous when you’re mentally impaired. What are the symptoms of a messed up circadian rhythm? Being sleepy is the most notable symptom, but there are others, too. Having an inconsistent schedule can lead to something called circadian-rhythm sickness. Again, the circadian rhythm controls a variety of biological functions, not just sleep. Therefore, adjusting it in a way that isn’t consistent with natural patterns can cause a long list of issues and ailments. There’s no pre-determined length of time that will predict how long it will take to fix your sleep schedule. It’s going to depend on how “off” it is and how long it’s been that way. Most experts say to plan for two weeks up to two months for your new habits to set in. Once you are back on cycle, follow the tips included here to stay on track.